April 27 I was looking at the Ophel Excavations that are under the direction of Dr. Eilat Mazar. When I saw the tarp, I decided I would make a photo in hopes of learning something new in the future. The future is now. 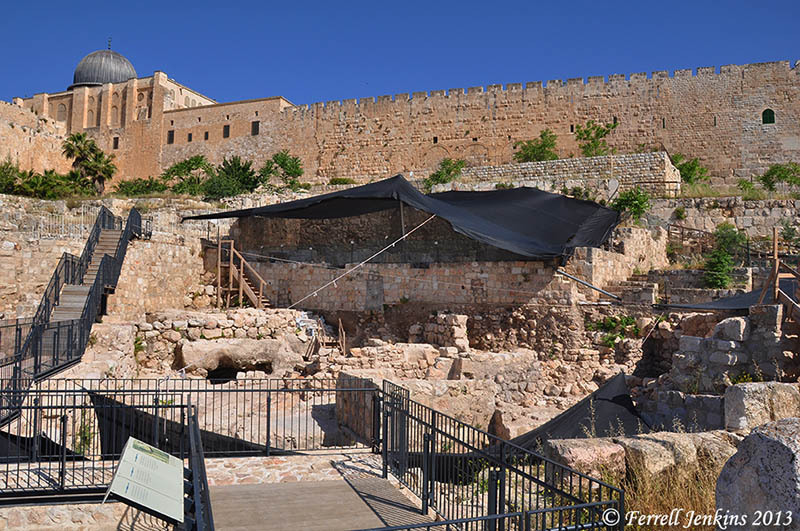 According to The Key to David’s City, a web site devoted to the work of Herbert W. Armstrong College in Jerusalem, Dr. Mazar officially reopened the excavations on April 22. In this continuation of the second phase Dr. Mazar will continue uncovering what she believes is a royal complex belonging to King Solomon, dated to the 10th century B.C.E., located at the foot of the Temple Mount in Jerusalem. As she works to expose more of this massive structure, the excavation will continue “to follow the remains of the First Temple Period along the line of the City Wall,” she told us. The Key to David’s City web site has posted several nice videos explaining some aspects of the archaeological work at the site. The Gallery includes some excellent photos. My photo below shows the area of the new excavation. Area of new Ophel excavations. Photo by Ferrell Jenkins. We called attention to the Ophel Excavations 2012 here. Jothan, king of Judah (740-732 B.C. ), is said to have built extensively in the area known as Ophel.